CPU-Z, the popular CPU information utility, comes with a CPU benchmark module. This CPU benchmark is available since CPU-Z 1.73 (released in 2015). The CPU benchmark performs two quick tests: a single threaded test and a multi threaded test. 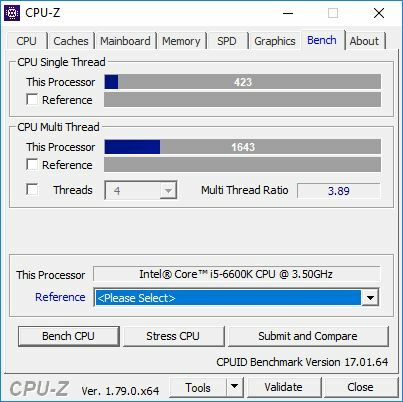 In the latest CPU-Z 1.79, the CPU benchmark has been updated to better handle new multi-core CPUs like AMD Ryzen, and scores have no longer relation with previous versions of CPU-Z. Almost two years later, Ryzen was introduced, and scored – core for core and clock for clock – almost 30% higher than Intel Skylake. After a deep investigation, we found out that the code of the benchmark felt into a special case on Ryzen microarchitecture because of an unexpected sequence of integer instructions. These operations added a noticeable but similar delay in all existing microarchitectures at the time the previous benchmark was developed. When Ryzen was released, we found out that their ALUs executed this unexpected sequence in a much more efficient way, leading to results that mismatch the average performance of that new architecture. What does the new CPU benchmark do? The new benchmark computes a 2-dimensional noise function, that could typically be used in a game to generate a procedural map. The code is written in C++, and compiled with Visual C++ 2008. No special instruction set is used, but the x64 version uses scalar SSE/SSE2 instructions to achieve floating point operations, whereas the 32-bit version keeps using the legacy x87 instructions, resulting in almost half of the x64 performance. More information about the new CPU benchmark in CPU-Z 1.79 can be found in this article: CPU-Z 1.79 : new benchmark, new scores. So, to have some elements of comparison, here are some scores with CPU-Z 1.78 and CPU-Z 1.79. Hey, interesting stuff (you turds who won’t release harmlesscomments). I really don’t get why they did that. That’s no how it is supposed to be done. As a benchmark maker, if you see that a processor performance is not reflected by the performance of your benchmark, you add other benchmarks. You don’t cripple the scores arbitrarily. Thanks, I didn’t notice it. Actually, the typo comes from the original article at cpuid.com, but I will fix it here.